Adopted on March 5, 1974. 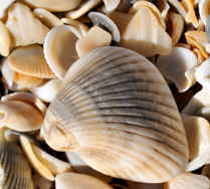 On March 5, 1974, Virginia adopted the most popular of state shells, the eastern oyster, (Crassostrea virginica,) which also represents Connecticut and Mississippi. Several Virginia Beach school children carrying oyster shells gathered around Governor Mills E. Godwin Jr. as he signed the oyster into law. One girl presented Godwin with a shiny oyster shell, and he said, "I come from down in oyster country, you know." 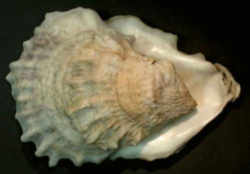 A school group came up with the idea of adopting the oyster which was introduced in the legislature by Owen B.Pickett of Virginia Beach. Pickett thought an official oyster might help promote tourism. Virginia's oyster capital is the Menchville area. 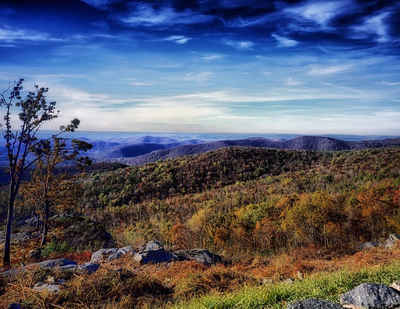 It is located in southern Virginia on the James River, the largest natural seed oyster bed in the Chesapeake Bay area. In winter, boats from all over to Virginia coast gather at Menchville to work on the public seed beds. Boats from Maryland and northern Virginia also visit Menchville to buy seed oysters, which they plant in the upper Chesapeake Bay and in rivers. Virginia even has an official boat to harvest oysters from, the Chesapeake Bay deadrise! The Eastern oyster is relatively large, growing up to 10 cm. in length. It is normally somewhat pear-shaped in outline, but members of this species vary greatly in size and shape. 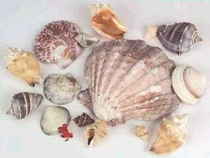 The shell is dirty gray externally and white internally, except for the muscle scar, which is deep purple. Oysters usually colonize in beds. Competition for space is a most important source of mortality. Uncrowded, oysters can live to be 20 years old. The beds are a permanent social structure unless they are separated physically and forcefully. Otherwise, the oysters will re-congregate if they are capable. The law designating oyster shell as the official Virginia state shell is found in the Code of Virginia, Title 1, Chapter 5, Section 1-510. Virginia symbols were re-organized under one section of the Code of Virginia in 2005.